Today, Tuesday 18 June 2013, marks 32 years since the establishment of the Organisation of Eastern Caribbean States, OECS. Thirty-two years of facilitating efforts by the nine Member States to further develop the people of the OECS region through various programmes and projects in several cases with the help of the international donor community. A statement from the OECS Secretariat said that much attention has been given to two of the key pillars of economic development in the OECS namely Agriculture and Tourism; collectively because of the nexus of the two sectors and individually through specific needs. The OECS Secretariat is coordinating a collective Plan of Action by Member States towards enhancing the region’s Agriculture Sector. Other interventions include training in Information and Communications Technology for persons associated with the Agriculture sector, with particular reference to the collection and management of critical data and related information,, increased efforts towards enhancing Agriculture Food and Health Safety Systems in Member States. In Tourism, work is being advanced on the implementation of an agreed OECS Common Tourism Policy. Programmes and policies are being formulated and harmonised in other areas across the Member States of the OECS Economic Union, which can yield further significant benefits to the people in the OECS in areas such as Manufacturing, Construction, Information and Communications Technology (ICT), Trade Policy and Trade Facilitation, Transportation, Energy, Ocean Governance and the Environment. Of special importance is the OECS E-Government for Regional Integration programme has advanced Information and Communications Technology (ICT) utilization through the movement towards the electronic transformation of the public sector in the Member States. Tax E-filing and E-procurement, for example, will improve the efficiency of the public sector, ease the price paid by consumers for goods and services, and enhance investor confidence in the OECS. Work on the preparation of an OECS Development Strategy, incorporating all of these areas, among others, is well advanced with the development strategy among the extended focus areas at the recently held 57th meeting of the OECS Authority. The bastions of functional cooperation in the OECS remain solid, sustained and meaningful to the people of the region. In health there is the bulk procurement of pharmaceuticals which quite timely will switch to the first electronic-procurement system in the Caribbean on 20 June 2013, during this week’s observance of the OECS 32nd Anniversary. The outlook for this is even brighter with specialists anticipating even more affordable costs for medicines and medical supplies to the people of the region. Under the guidance of the Eastern Caribbean Central Bank, the Eastern Caribbean or EC dollar remains robust, constant, steadfast and unshaken in exchange value amidst the global economic spill. The Eastern Caribbean Civil Aviation Authority, the Eastern Caribbean Supreme Court and OECS Joint Diplomatic Trade Missions in Brussels and Geneva Stand out internationally among the beacons of OECS Integration and Trade. Programmes continue in many other key areas such as Climate Change Risk Reduction; part of a lager Environmental Management and Sustainable Development agenda, Juvenile Justice Reform and Education. A most defining moment in the history of the OECS to date has been the operationalization of the OECS Economic Union. This year the OECS Region embraces two years since its Independent Member States commenced operation of the OECS Economic Union; a new development designed to enhance the way of life for people of the region in the long term. The commencement of the OECS Economic Union followed the historic 18 June 2010 signing of the Revised Treaty of Basseterre. The Treaty, which entered into force on 21 January 2011, creates a single economic and financial space covering participating OECS Member States, and sets the stage for deeper OECS integration where it is intended that within the single financial and economic space all factors of production — goods, services, capital and people — will move without hindrance. This will provide direct benefits to the people of the OECS, by facilitating seamless travel for purposes of gainful employment, setting up business, trading, education, as well as for leisure. Since then deeper OECS integration has been further manifested through the commencement of the free movement of people across the Member States of the OECS Economic Union on 01 August 2011. May 2012 saw the first meeting of OECS Heads of Government and Leaders of the Opposition under one roof to discuss issues relating to the operationalization of the OECS Economic Union. Friday 10 August 2012 marked a further successful outcome; the Inauguration of the OECS Assembly, headquartered in Antigua and Barbuda. Through the OECS Assembly, the people of the OECS Region have the opportunity for their issues to be discussed and debated publicly in a regional forum. Then first official sitting took place on 26 March 2013. The OECS Assembly is one of five principal organs of the OECS Economic Union. The others are the OECS Authority, the Council of Ministers, the OECS Commission, and the OECS Economic Affairs Council. Very recently Montserrat, one of the founding fathers of this Organization became the seventh OECS Member State to ratify the Revised Treaty of Basseterre (RTB) granting them full participation in all governance structures established under the RTB including the OECS Commission, the OECS Assembly and the Economic Affairs Council. 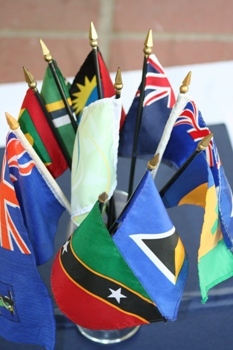 The celebration of OECS Day is in order but the work goes on as OECS Member States move towards broadening their relationship with other territories and further deepening the Economic Union towards enhancing the lives of the people of the region. Chairman of the OECS Prime Minister of Antigua and Barbuda Hon. Baldwin Spencer will make an official address this week as part of the 32nd OECS Anniversary activities. The Member States are Antigua and Barbuda, Dominica, Grenada, Montserrat, St. Kitts and Nevis, Saint Lucia, Saint Vincent and the Grenadines, Anguilla and the British Virgin Islands.